Washington, USA -- Individuals who engage in compassion meditation may benefit by reductions in inflammatory and behavioral responses to psychological stress, a new study has found. The study has been published online at www.sciencedirect.com and in the medical journal Psychoneuroendocrinology. “Our findings suggest that meditation practices designed to foster compassion may impact physiological pathways that are modulated by stress and are relevant to disease,” said Charles L. Raison, MD, clinical director of the Mind-Body Program, Emory University’’s Department of Psychiatry and Behavioral Sciences, Emory School of Medicine, and a lead author on the study. Sixty-one healthy college students between the ages of 17 and19 participated in the study. Half the participants were randomized to receive six weeks of compassion meditation training and half were randomized to a health discussion control group. Although secular in presentation, the compassion meditation program was based on a thousand-year-old Tibetan Buddhist mind-training practice called “lojong” in Tibetan. Lojong practices utilize a cognitive, analytic approach to challenge an individual’’s unexamined thoughts and emotions toward other people, with the long-term goal of developing altruistic emotions and behavior towards all people. 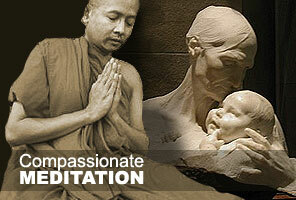 Each meditation class session combined teaching, discussion and meditation practice. The control group attended classes designed by study investigators on topics relevant to the mental and physical health of college students such as stress management, drug abuse and eating disorders. In addition, a variety of student participation activities were employed such as mock debates and role-playing. Both groups were required to participate in 12 hours of classes across the study period. Meditators were provided with a meditation compact disc for practice at home. Homework for the control group was a weekly self-improvement paper. After the study interventions were finished, the students participated in a laboratory stress test designed to investigate how the body’’s inflammatory and neuroendocrine systems respond to psychosocial stress.